Two habits build #emotional_intelligence in children. Remembering what matters is the first. 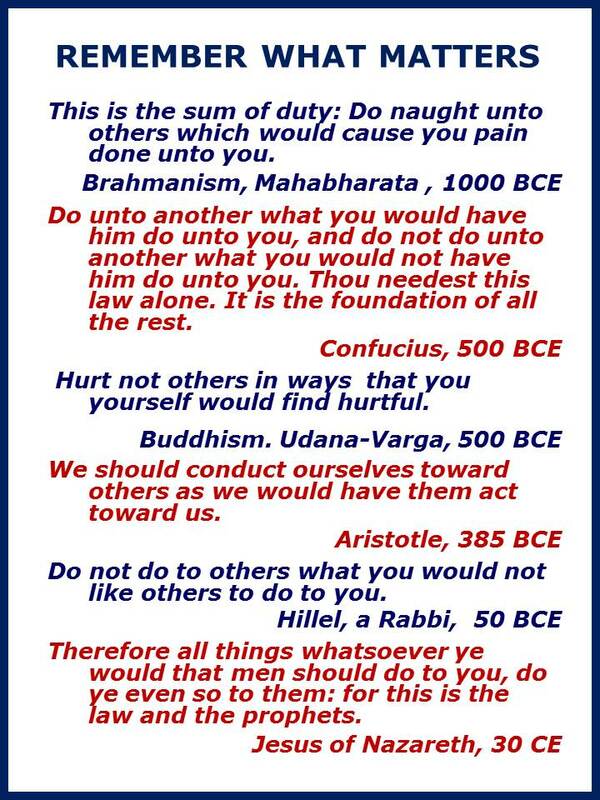 Practicing Deliberate Kindness is the second. Putting what matters into action matters as much as remembering it. 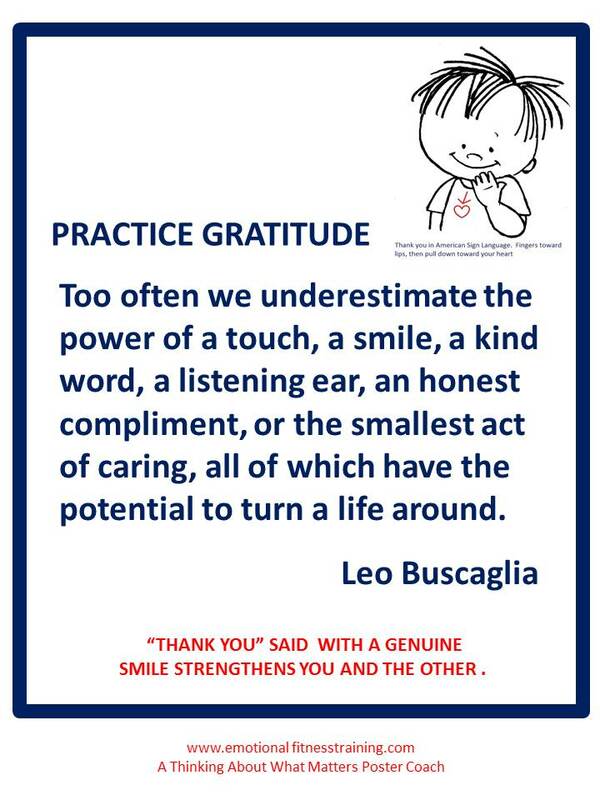 Practicing kindness every where you can, when you can and as often as you can. A child can learn to say “Thank You” in American Sign Language, long before s/he can speak. Signing “Thank You” is similar to blowing a kiss, but the hand moves down over the heart. 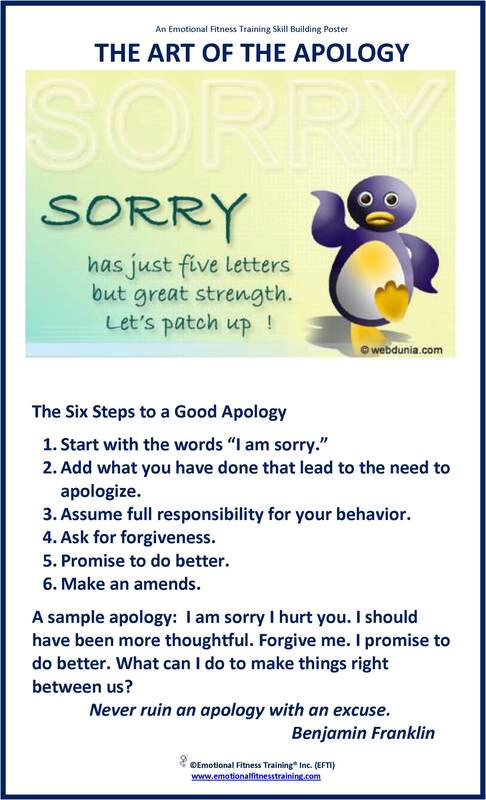 The next lesson to teach is how to say “I m sorry.” This goes hand in hand with using time out as a disciplinary tool. The child is released from time out and expected to say “I’m sorry” and only then to get a hug. This can also be taught as sign language. To sign “I’m sorry,” make your hand into a fist and rub it in a circular motion across your chest. It is like you are rubbing around your heart. All of the Poster Coaches used in this blog post can be downloaded free from the EFTI store. Apologizing does not come easy to many. Men seem to have the most difficulty, however, actually apologizing to a child seems difficult for most adults. The more you can apologize and the more you teach your child to do the same, the more good feeling grow both in your heart and in all relationships. So let me remind you that if my posts annoy, I apologize. I will not stop my efforts to help, but ask you to stop following me. I will not be hurt. Given that my father was a news reporter, and wannabe writer, I wanted to be the same. I’ve done that and it has not been easy, nor have I had the great success I aspired to even though I did appear on Oprah. I do think, however, both my parent’s teaching and empathy for the less-abled, related to my disability, Both gifts have lead to a deep-seated desire to be kind. This entry was posted in Parenting Issues and tagged Deliberate Kindness, Emotional fitness, Emotional Fitness Training, Emotional Health, Katherine Gordy Levine, kindness, Parenting advice, parents, Parents Are People Too, postaday, Thinking about what matters. Bookmark the permalink.